So a friend of mine had this ol' Suzuki 250 dirt bike laying around. I mentioned to his mom that I had been tinkering with dirt bikes lately and she said that her son had one laying around that he never used. Oh really?? Seems that he bought the machine from a local dealership owner who's kid raced it a little while. It is outfitted with all sorts of goodies and most importantly a Pro-Circuit full exhuast system. 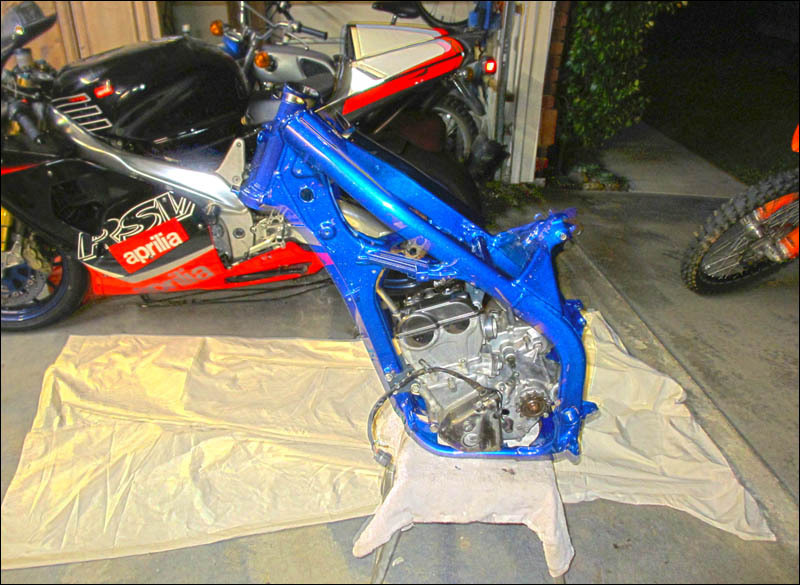 The poor RMZ was in pieces simply because it wouldn't start and they couldn't get it to run. No problem. I'm just the guy to give it a good home. 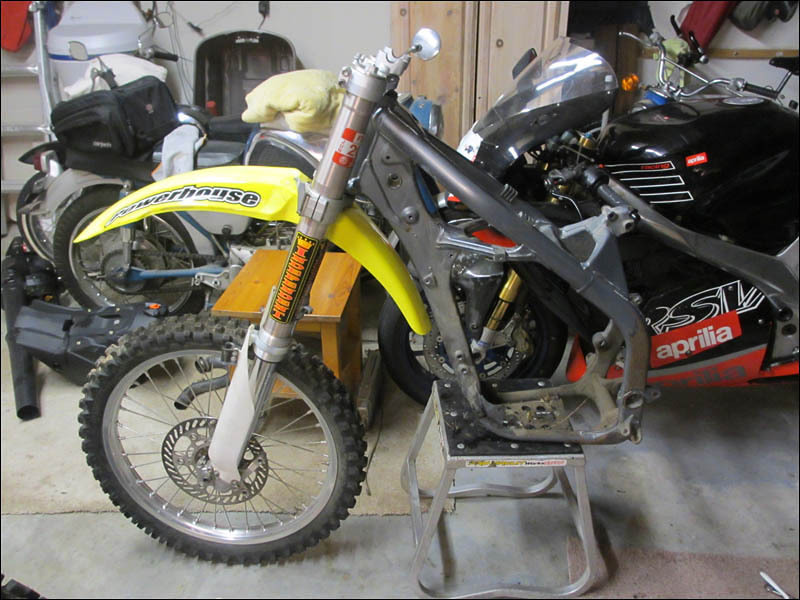 Here is what the bike looked like before I got my hot hands on it. Last edited by Smithers; 02-13-2013 at 11:23 PM. The bike was all there so I just assumed it needed a valve job and some carb tuning and that's basically what it needs it turns out. I stripped it all down and took the frame away to Powder Coating USA powdercoated. Then I replaced all the seals in the engine and check the valves... yep too tight. They valves have to be checked often in these small bore, high rev 250cc 4 strokers and when they get tight they won't start anymore. I sanded down one of the shims on the intake side to get it back in spec and just put the engine back together tonight. I'll update with many more pics of the tear down, the metal finishing work I had done and the cleaning sessions. I really lost my mind and went above and beyond on this one. Dirt bikes are so easy to tear down and revive compared to a truck or an old streetbike so I really am having fun. Every time I work on the project a lot gets done so it's fun to see the progress. I had a very hard time not painting the engine silver but it cleaned up really good and I'm ready to start seeing it go back together so I can ride it finally. There is no way I could let this fly! Time to degrease and remove all that sludge. All that grime slows you down. Last edited by Smithers; 02-13-2013 at 11:39 PM. Interesting find, Ryan. So, when you mention that the valves are too "tight", are you saying that the valves didn't slide freely in the valve guides, or the valve clearance was too small? 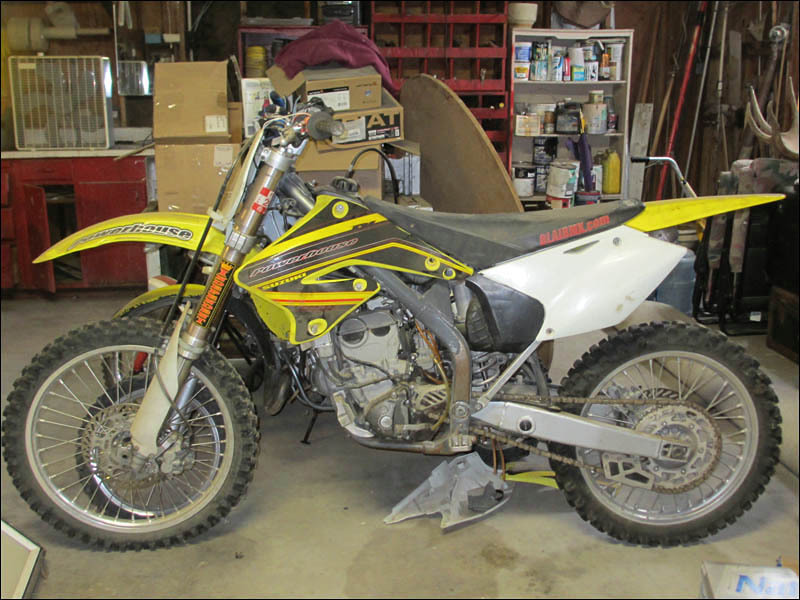 Why would this happen to these high-revving dirt bikes more than street bikes? Keep us posted as the patient goes back together. I'm always looking to work on something that's new to me. Since they have become popular the high revving 4x's (I'll use this instead of typing out stroke each time) have been known to be expensive to service and keep in good running order. This might have been true with the engines of the first few years of 4 strokes but after 2005 I think the main Japanese mfgs have most of the bugs worked out. KTM had a VERY dependable engine that was good ever since it was introduced in about the year 2000. This engine was called the RFS type engine and it's probably one of the most famous engine family for off road bikes. But that's another story.. and it has to do with why I bought my KTM400 dual sport bike. 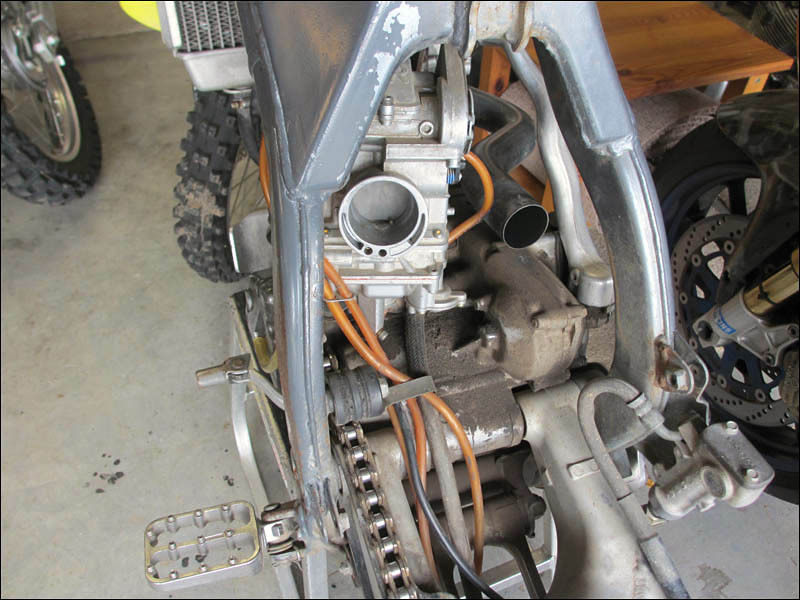 For many years, the motocross world almost exclusively used two-stroke engines. AMA racing classes had two classes: 125 cc and 250 cc two-strokes, with no provision for four strokes. Most riders considered four-stroke engine technology to be antiquated and uncompetitive.Additionally, most four strokes produced very little power (the 1996 Honda XR400 made 32 bhp (24 kW), compared to the 40 bhp (30 kW) produced by most 250 two-strokes of the time). In 1996, the AMA changed racing rules to allow 450 cc four strokes to compete in the same racing class as 250 cc two-strokes.Yamaha engineer Yoshiharu Nakayama first came up with the idea of creating the first competitive four-stroke race motocross bike.The Yamaha YZ400F was developed to fit into this category. It solved the power dilemma by borrowing superbike technology and giving the YZ a five-valve head, liquid cooling and a 12.5-1 compression ratio. Last edited by Smithers; 01-31-2013 at 09:26 PM. Anyhow one of the KEY ways to make the 4x's competitive and quick to rev was the addition of titanium valves. Of course 2x bikes have no valve train so any type of valve, cam or chain is a huge drain on throttle response. Here is where all this adds up in this story... the titanium valves wear down quite fast compared to steel. This is why my engine had valves that had worn down to the point where they are too tight to open up fast enough for the engine to start. I'm sure this is why the bike was left to collect dust in a barn. The fix for the casual motocross or enduro rider? Replace the Ti with stainless valves. The down side? About 30-40% heavier valves which leads to slower response. 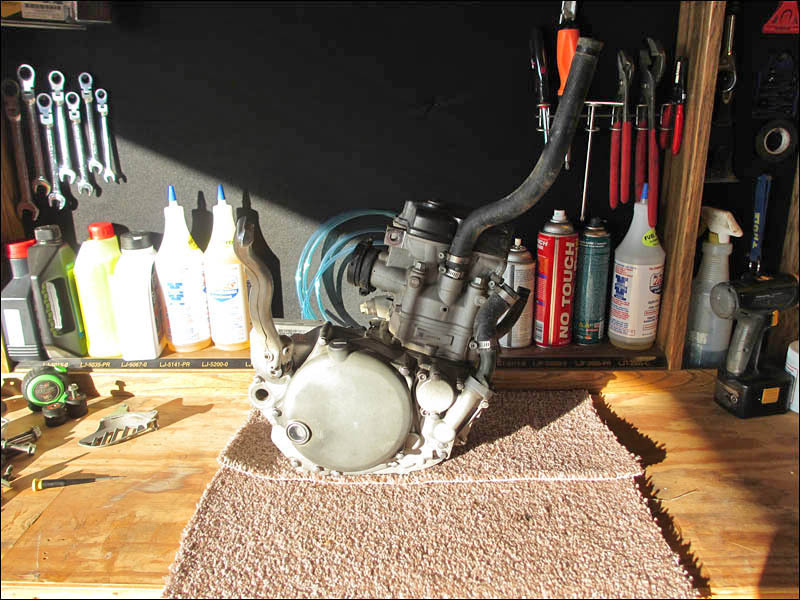 I've ridden a few dirt bikes to know how fast the engine should rev but I'm excited to get this bike revving to see how this 4 valve engine performs. I simply swapped the shims from one valve to the other on the intake side. This got one of the valves spot on with clearance and the other one was just a tad tight still. So I took the one oversized shim to the belt sander to remove some material. Next I polished up the ground side with a knife sharpening stone and all is well. Problem solved at no cost. Time to put her back together. I'll illustrate all this out with pictures later of course. I will probably go with the heavier and MUCH stronger SS valves when the time comes to replace them. I'm curious to see what how much of a difference it will make when the time comes. I'll bet the bike will still rev just fine and if anything help to make the bike more controllable for my girlfriend. She rides a 2x KTM 200 which has a ton of power and instant power on demand. So this 4x bike will help her focus on her dirt riding technique instead of just holding on for dear life. Last edited by Smithers; 01-31-2013 at 09:31 PM. Speaking of shims, I'm getting ready to adjust the valves in my Triumph 885 cc triple. I have a special tool for the job, which makes it easier. I think I'll start that in a month or so, while our Michigan weather is still snowy. 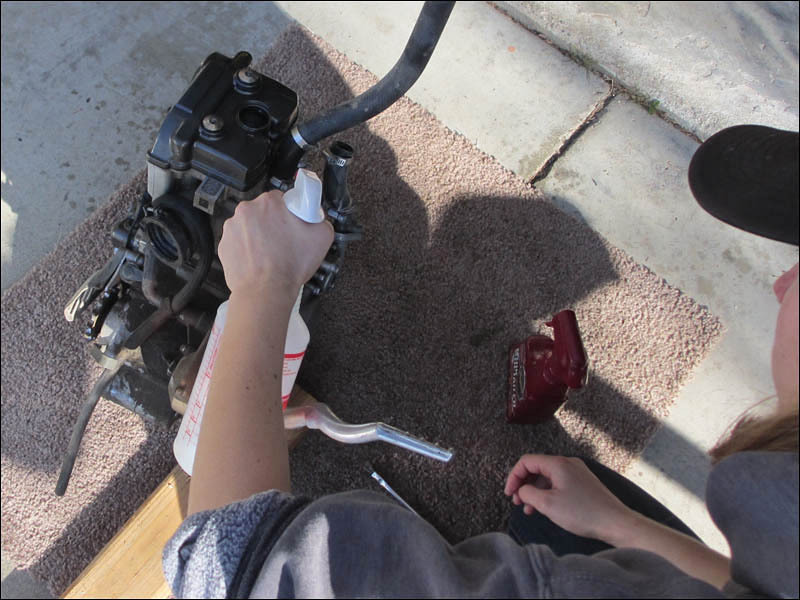 DOHC valve adjustments can be a pain compared to SOHC. I was surprised how easy it was on this little 4 stroke. All I hear is people whine and complain about it. They just don't want to work on anything or they hate paying attention to detail. And I'm not going to wait for a couple days for a dumb shim to come in the mail - or spend a day and $20 in fuel looking for one! If I order anything it's going to be a new set of valves and a shim kit that will last me my whole life. I was about to break down a how-to on how I sanded it down but it's too simple and the pictures would only work to convince the nay-sayers. Belt sander had a worn out 180 belt on it so it wasn't too aggressive. At first I was wondering how the heck I was going to remove material from such a strong little piece. A file was a joke against it. The sander really wooped up on the shim but I had to use a small socket to hold the shim in the end of it. They heat up instantly when that much friction is applied. Cleaning up the rough side is more of a chore for sure. It has to be polished smooth to keep it from cutting down the surfaces when in operation (I imagine) . So my brand new knife sharpening block and a few drops of oil cleaned it up in about 10 minutes of work. A machinist friend of mine said that's how a couple professional motorcycle mechanic friends do it. You just have to have the tools handy or else you might as well start driving or order some up on the net. And after doing the valves on a couple shim and bucket Lexus V8 DOHC engines this single cylinder is as easy as taking out the trash. That Triumph will be a fun exercise for you. It won't take long. I'm sure there are all sorts of how-to pictures online. It's really almost odd to have to adjust the valves on modern streetbike engines. They don't take nearly the beating that off road equipment does. I'm hoping that the Triumph's 12 valve shims don't all require replacement, or can at least be shuffled around a bit. I'll just get new shims, but I have done some research and have learned that there are compatible shims for Kawasaki and Honda, so at least the shims should be available. The bike is a blast, and those 3 cylinder balance-shaft engines are quite smooth. I tell my wife that the "chicks dig me" on my Triumph. She just says that I look like an old guy on a motorcycle. Good to hear they take a standard shim. 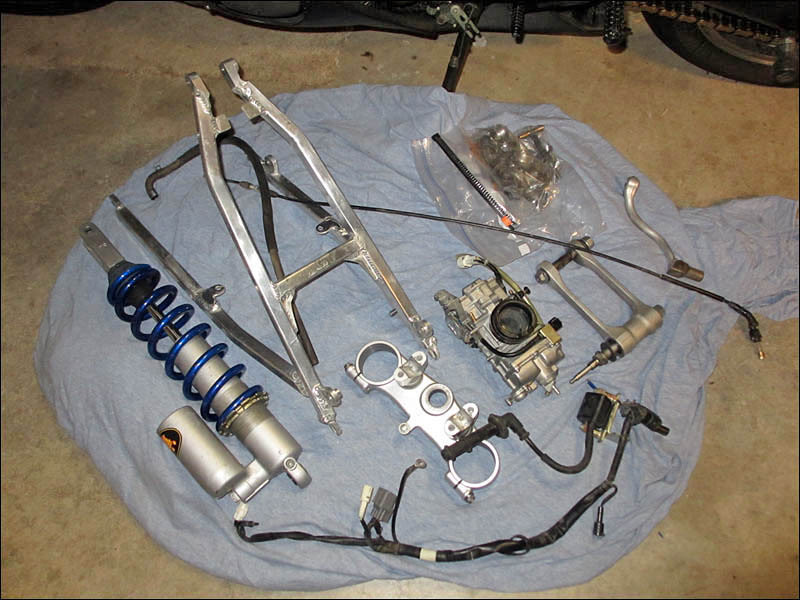 I was just looking over a performance machine website and they sell shim kits with more shims than you'll ever need for like $79 (example) . I would like to have one of those... I'll probably be needing to buy one of those pretty soon depending on how deep I get into this RMZ I'm sure you'll be able to make sure all the valve specs are good with ease. I predict you will hardly need to adjust any of them actually. A lot of local shops have shims laying around that they will sell you for cheap. I have heard of some shops even trading out shims with the ones that you are replacing if you ask nice. Those Triumphs are GREAT running motorcycles with wonderful manners. I know a lot of fellow riders that have tossed around the idea of picking one up. There are just too many bikes to choose from these days! There is a local guy that has a beautiful one and I run into him from time to time. He's always bragging about it. Hey it doesn't matter what motorcycle you are riding. All girls are jealous when they see you riding around. Any girl I have given a ride to on one of my bikes will declare my bike "theirs" and they get upset when they see me giving a ride to another girl! I've had them call me and say "HEY! That's MY motorcycle. What was that chick doing on the back of it!?" So I talked with my performance machinist and he has done a few 4x heads in his time. He said I should just pop for the titanium valves and just run the valve clearance a tad loose while keeping the high quality oil fresh. He also recommended running race fuel through it to keep the lubrication qualities of the fuel in check (today's fuel is dry and doesn't lube well as we all know). Or he recommended using a fuel additive in pump fuel to keep things from premature wear. Of course we also talked about how I should be taking the head off to check for wear in the cylinder and to see how far gone the valves are. But then I can't help but think.. what the heck I might as well change out to a new piston and rings too! 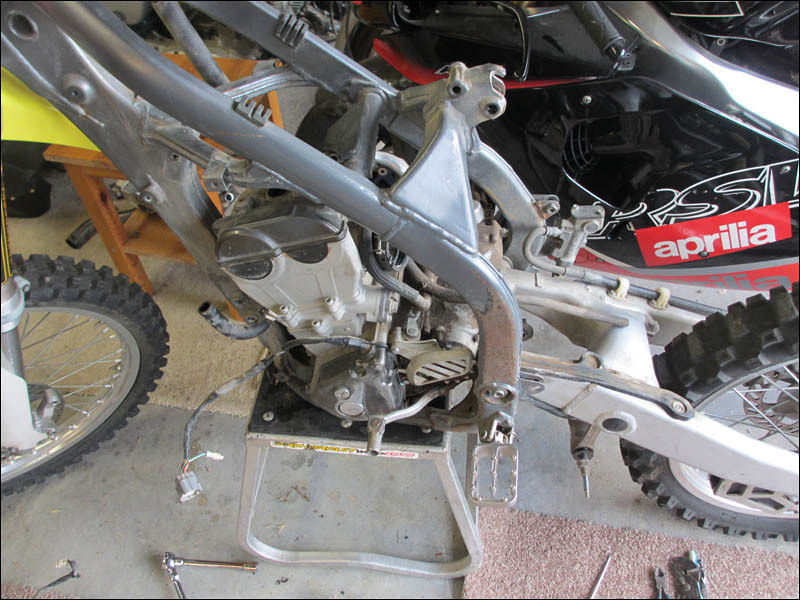 I just want to ride the thing so I'm going to put it back together tomorrow. The bike wasn't neglected so I'm not so worried about the condition of the internals so much. It was run with race fuel most of it's life. BUT I haven't even tried out the transmission so if the trans is no good I won't be caring much about the top end! I just need to see how it runs and worry about preventative maintenance later on. Last edited by Smithers; 02-13-2013 at 11:47 PM. Keep us posted as you start it for the first time. Once it's running and you cycle through the gears, you'll certainly know a lot more. I can't take it anymore! I'm going out to tear the engine down right now. Mwuahahahaaa! It would be pure neglect not to take the head off to check the valve wear and condition of the cylinder. I'm going to flog this engine hard so it better be right. I found a killer deal on a set of new valves (which are super expensive to begin with) so I need to know if I should grab them now. 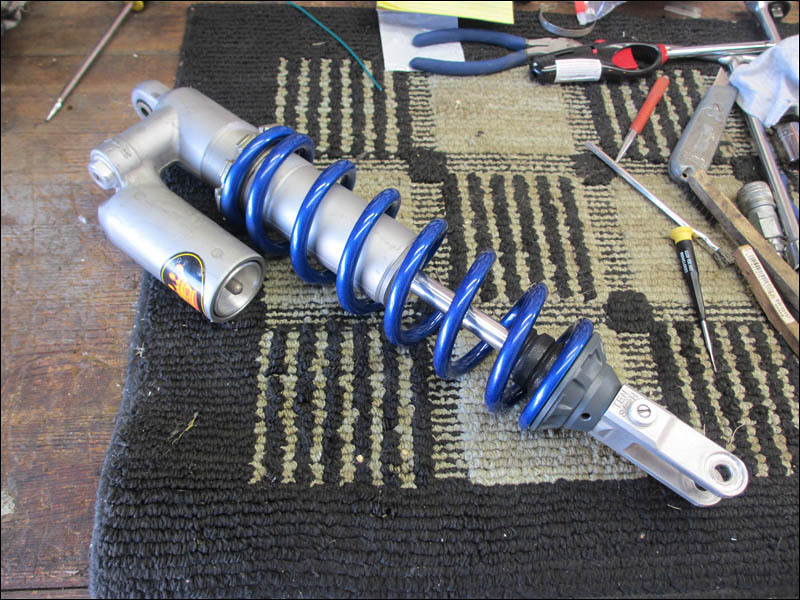 Here is a look at the rear shock as I had the spring coated the same as the frame and the collars I had done in a grey coating. And the frame turned out perfect. It's impossible to get the metallic quality in a picture so I did a light and dark exposure overlay for fun. Last edited by Smithers; 02-13-2013 at 11:58 PM. Ah, the suspense is killing me. If you didn't live 2500 miles from me, I'd swing over and give you a hand. I couldn't resist. So it took literally 4 bolts and a couple smaller Allen cap screws to remove the head. Easy. The cylinder looks fine and the piston and valves look healthy with minimal carbon buildup. I cleaned things up and I'll be taking it to my engine guy to have him measure things up and make sure all the valve surfaces are in good order. A JE Piston kit, seals gaskets and valves will run about $400 altogether when the time comes. And that's a good deal on all those parts. 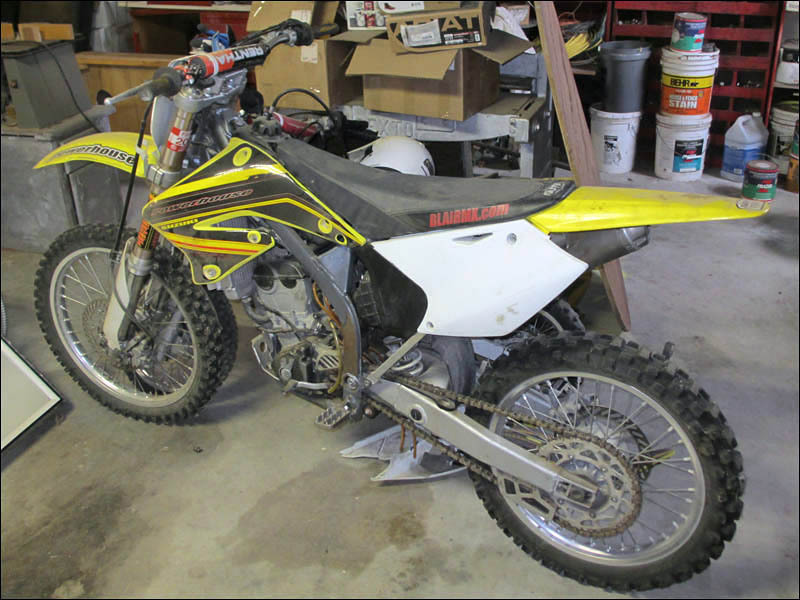 That's why resale value on these dirtbikes is so low. You have to just assume a used bike needs a rebuild unless the owner has records. And what better way to pass the time than to clean and shine up all the components in the meantime. Once clean - easy to keep clean. Last edited by Smithers; 02-13-2013 at 11:59 PM.